The last minute budget deal reached by the House and the Senate restores readiness shortfalls for the Pentagon and provides a firmer base of fiscal stability for the Department of Defense, Secretary of Defense Chuck Hagel and Chairman of the Joint Chiefs of Staff Gen. Martin Dempsey told reporters in a Thursday press conference. “Encouraged by the budget deal that congress has passed,” Hagel said. The Senate voted on Wednesday in favor of a budget deal that would lift the mandatory sequestration cuts from the Pentagon’s budget for two years and fully fund operations and maintenance accounts (O&M). Sequestration cuts to O&M money led to images of five aircraft carriers pierside in February and cancellation of several naval deployments. “[The deal] will allow us to address most of our near term readiness challenges,” Dempsey said. The 2013 Bipartisan Budget Act deal raised the caps on defense spending for the Fiscal Year 2014 Pentagon budget to $520.5 billion and Fiscal Year 2015 to $521.4 billion. Though not a complete elimination of cuts to the defense budget, it raises the caps by $22.38 billion in the 2014 budget and $9.33 billion in the 2015 budget. Additionally, the Overseas Contingency fund — the money primarily set aside for the war in Afghanistan — received an increase of $1.26 billion in FY 2014. 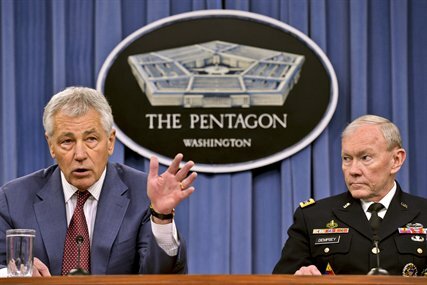 “It gives us some predictability for those two years,” Hagel said. The deal — crafted by the leaders of the House and Senate budget committees, Sen. Patty Murray (D-Wash.) and Rep. Paul Ryan (R-Wis.) — includes $63 billion in sequestration relief split between defense and non-defense expenditures, according to a Thursday report in Defense News. The deal would still leave about $32 billion in cuts the Pentagon needs to make under the Budget Act. Hagel and Dempsey did not say what areas they would recommend legislators should make cuts ahead of the release of the next Pentagon budget. But what is clear is major changes to the military’s size are still on the horizon, Dempsey said. “Force structure reduction [begun] under sequestration will still march on,” he said. The Pentagon will also tackle changes to military and retiree compensation , Hagel said. “We all know that we need to slow cost growth in military compensation,” Hagel said. Hagel said earlier this year with decreasing budgets, the Pentagon will have to make a decision between a larger force with less technology or a smaller more technically advanced force. The current budget deal includes a controversial move that would reduce disabled veterans benefits. Future military compensation reforms, “should not be applied to medically disabled retirees,” he said.